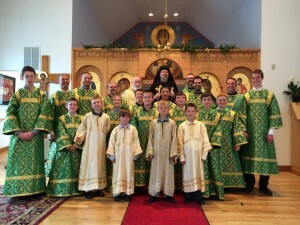 Clergy and altar servers—arrayed in new green vestments donated through a special appeal—gather with the visiting Archbishop Melchisedek after the Pentecost Divine Liturgy. June was busting out all over: a rapid-paced month just concluded at Holy Trinity and the Chapel this year. 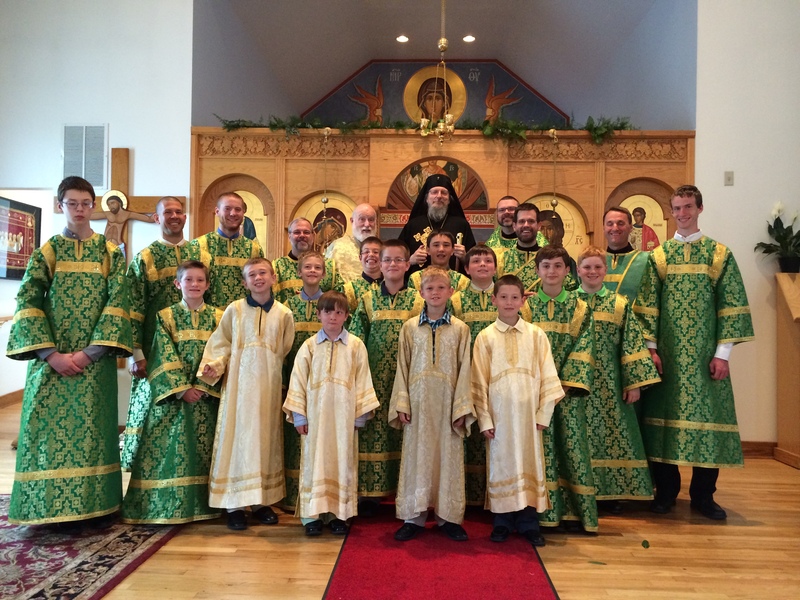 From the liturgical trifecta of Pentecost weekend, including the Archbishop’s visitation, to the Cross-planting at the Chapel, hierarchical liturgy and parish picnic, and rounded out with a peaceful Holy Spirit Day, it was comparable to Pascha in observance, duration and exhilaration. Pentecost now rivals Palm Sunday as the most heavily attended Sunday of the Church year, after Pascha! Related: More coverage on the Cross-planting at the Chapel of the Holy Spirit website. But it didn’t end there: Vacation Bible School was another rousing success under the direction of Deacon Mark and his team of teachers and helpers. It was Holy Trinity’s third edition based on C.S. Lewis’s classic Chronicles of Narnia. Kiddoes had to walk through a wardrobe every day to enter Narnia. Ask them what the wardrobe, or the lamppost, or Aslan, or the White Witch represents. Replete with “Turkish delight” and a Narnia cake, supper was served every night. Even the fish sticks were yummy! On June 22, the parish unanimously authorized the Parish Council to negotiate the best loan terms possible with the Archdiocese for construction of the Chapel. Voting was held conterminously at both Holy Trinity and the Chapel. Talk about unity of spirit and purpose! As we go to press, the much quieter month, (liturgically), of July begins. There is plenty going on in Happy Valley, nevertheless, including the inauguration of a new ministry for women, beginning with a picnic at the rectory on July 17 at 6 p.m. Ladies, make your plans to attend now.